Calendar comprehension is needed for functional purposes in life. It Is important your students have a good understanding of the calendar. These calendars in both Word and PDF will help to ensure your students have calendar reading mastered. There is a monthly activity for practice of reading and using the calendar independently. There are calendars for the months of October through June. Students are asked to complete activities based on the calendar for the month. The calendar is meant to be completed independently at the beginning of each month. 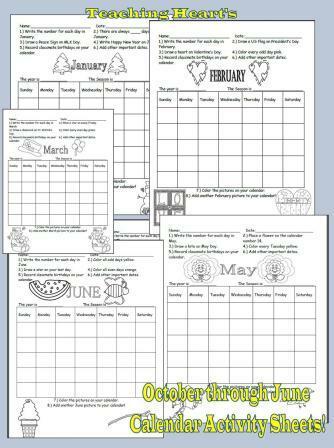 The calendar can then become part of the student’s monthly planner. Great for grades 1,2, and 3. Also good extra practice for Special Education and review of calendar concepts.